Ok, before you say anything, this is not a "recipe" in the traditional sense of the word--at least in the way that I define it. However, as a busy mom, I am always on the lookout for easy solutions for those days when I don't have much time to spend in the kitchen. 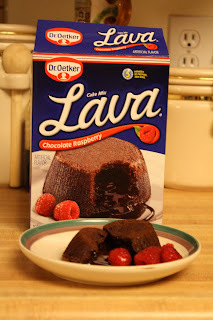 So, when I saw a box for Dr. Oetker's Lava Cakes touting a 5 minute prep time, my interest was piqued. And, being the chocolate lover that I am, I had to give the mix a try. The prep for the lava cakes really is easy. All you need to do is combine the cake mix with 2 eggs and 3 tbs of hot water. Poor the mixture into greased cups (the cups are provided in the package, all you will need to do is grease them) and pop them into the preheated oven for 20 minutes. Then, take them out and let them cool for five minutes before serving. Now, to the important part---how did they taste? They get a big thumbs up from my family. Since we tried the raspberry flavor, I paired mine with raspberries. The raspberries went really well with the cake and provided a way to sneak some fruit into the dessert. My husband enjoyed his with some caramel sauce. My daughter lopped hers up au naturel. Now, I must admit, that the cakes were not as decadent as some that I have had from scratch. However, I think that they make a delicious and easy dessert solution, perfect for a midweek treat or for those in a time crunch. Thanks for the follow! I am following back!! Come and join my Made U look Thursdays! I am having my 1st project & recipe link up! I have joined so many link ups in the couple of months, that I think I am ready to host one myself! So please come by and link-up a craft, recipe or just something made by you, old or new. I am also hosting a Tuesday Blog Hop and it is still going on, for you to link up and meet more fellow bloggers. So check it out! Oh and I saw your other comment... I don't have a follow button like Blogger, I use WordPress as my Blog host. But, you can follow by email, FB, Twitter, Network Blogs. I am a member of GFC but WordPress does not allow me to host it at this time. I can follow you on it though. Sounds good! We have a recipe to link up. I have a few craft ideas that I will be able to link in the following weeks! Thanks for the follow!